This is an odd one to review because it’s not really a Fringe show like the others. Most of the Fringe is small-scale short plays, sometimes executed poorly but pretty much always finished. Polly Peel is the first draft of act one of a pretty large production. The team is using the Fringe as a workshop of what could be something really impactful. Though it’s jarring to only get half a story, the first act of Polly Peel is already in really good shape and it’s the sort of thing we’ll all be bragging about having seen when the full musical goes the places it’s definitely going to go (my guess- a Musical Stage Company co-pro with Mirvish at the very very least; I’d love to see it cross the border). Hannah Levinson is a game-changing find in terms of being able to tell kid-focused stories and this third major role in a row is her best showcase yet. 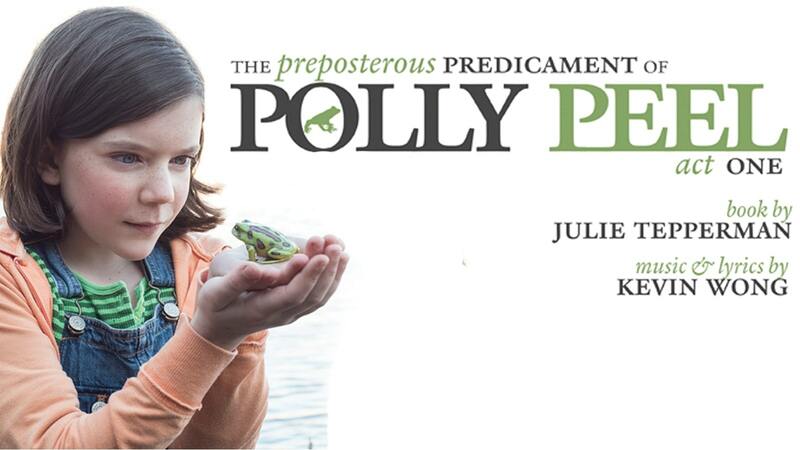 Written by Julie Tepperman (book) and Kevin Wong (music & lyrics) and directed by Aaron Willis, Levinson’s Polly is precocious but (incredibly) not obnoxiously so, she’s smart and scientific and bossy in a way that more young female role models should be. Her gentle father Paul is played with a big heart and hilarious timing by Troy Adams and Jessica Sherman brings key warmth to Polly’s strict mother Pauline in what might be the show’s trickiest role. Faly Mevamanana plays older sister Paula with excellent emotion though her voice isn’t strong enough to carry the standout power ballad “Focus” that has the potential to become an audition staple someday. Polly Peel is polished and sophisticated beyond usual Fringe expectations, because it’s not really a Fringe show; it’s a #StartedAtTheFringe show. The first of two Martin Dockery shows in the festival, this clever two-hander centers on a tricky conceit that’s not totally clear until the very end so writing about it without spoiling it is basically impossible. Suffice to say that it’s a hoot- quick and fun and played with incredible precision by Dockery and John Paterson. If you’ve never seen a Martin Dockery storytelling show, you need to see a Martin Dockery storytelling show. His energy is incredible, his timing fantastic, and he constructs his shows using this layered journey structure that always has a really satisfying payoff. The Bike Trip is a funny and sneakily emotional story that’s mostly about LSD but is really about identity and loss. Dockery moves fast so you have to pay attention but the rewards are worth it. The final scene of this oddly disconnected play that’s more just about relationships in general than specifically first dates features a monologue by David Fox as a character simply titled “A Man of Age”. The monologue is delivered as he slowly dresses himself in a black suit. Though Fox struggles to remember all the words (he even paused at the performance I saw and requested a prompt), his sincerity and vulnerability make the entire play worth seeing. The rest of it completely doesn’t work with clunky transitions and a strange structure that only gives the least interesting characters more than one scene. Aaron Berger’s original songs that are littered throughout are sweet but they fail to connect the assorted scenes into a full play. Set up like a seminar on marriage and parenting taught by real life married couple Tamara Bick and Drew Antzis, the informality of this show masks its lack of polish (scripts on music stands, a few dropped lines) but its lack of substance is unmaskable. The #unresolvable arguments the couple presents in the play are cliché disputes that fall straight down predictable gender lines (she doesn’t like his cargo pants!) and their complaints about in-laws are as fresh as an Everybody Loves Raymond rerun. It’s a fine show, good for a few laughs and not devoid of charm, but it needs to delve way deeper. This over-dramatic, self-serious musical illustrates what’s so frustrating about so many Fringe musicals. The songs are derivative and simplistic, the story silly and outlandish without indicating purposeful parody. Though none of the characters are all that likeable, a few are cartoonishly villainous then ask for the audience’s sympathy. The only reason this show earned a C rather than a D is that the cast has uniformly excellent voices and, though what they were singing was nonsense, it was pleasant enough to hear them sing it. Dishonored 2: Shall we gather for whiskey and cigars?